Below is a draft of the piece I’ve just written for White Rabbit’s Are You Sitting Comfortably. The next event in London is on March 22. GO. It is lovely and they are very nice. And there are free chip butties. The theme for the call out is Crime. I will probably send my piece in even though what I’ve written about it, well, what it is. 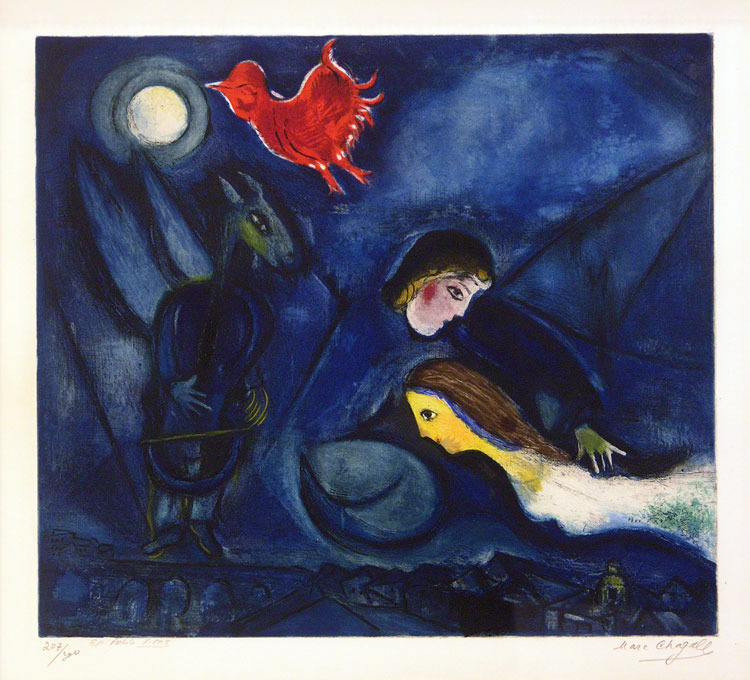 Picture by Chagall. I am a little bit taken by quotes by Chagall at the moment, despite never really liking compilations of quotations. They seem to be a little bit reductionist, but I won’t go on about that here. This is the place. It must be. I think it is. She had said one step to the right, fifteen paces beyond the miniature pond and the laughing cow, and nowhere near the trellis with its scented blooms of winter roses. Aha! A reference to Anton Chekhov. She must have really been in love. A Frenchman once told me, in Chekhov, no one ever tells the truth. It is all lies. All a painful game. “I love to eat at night.” A lie! “Here’s some cheese for you.” Liar! Sonya, the woman in love, fibs about foodstuffs in lieu of love. There is something so intricate about the way feelings are constructed. Perhaps they grow like mushrooms, the mesh of roots, spreading below the surface of what we see, the alien flesh rising to greet the pale moon only when conditions are made right. Tonight, as I tread softly, softly, in search of a truth, I think of the bodies and of the worms, locked in a silent, earth-turning underground dance. Which is up and where is down? Can we ever know what passes through the minds of those who commit dastardly actions? Perhaps the loaf of bread was snatched to save his starving family, but the elderly baker died of fright and now his wife, alone and without love, lights the ovens no more. I loved, once. I think I did. A kind of madness, it seemed. Warmed to the point of white heat, everything I cared for before seemed burnt away. Evaporated. Almost never there. A Herculaneum. Ashy ghosts stain pure clean sheets with the reminder of outside. Here was love, love that was the universe alive and ablaze. In the cool of the milky night, here, fifteen paces beyond the miniature pond and the laughing cow, and nowhere near the trellis, my pupils dilate, hungry for answers. I stop and sit for a moment. There is no real rush. I am full of fear of what’s to come but I am in control. I have brought myself to this place. I have accepted that time will pass – time does pass – and that the pain of our loss, for it is shared, will pass too. The surface of the miniature pond reassures me in its almost stillness. Little boatmen skid about in their happy world. I perch on the low stile. After a few quiet moments, the crinkled foil on my lap reveals sandwiches, crusts neatly cut. Cheese and pickle. Strangely comforting. I survey the grounds before me. It’s ideal. Idyllic. Everything in its place and nothing out of turn. There, the tennis lawn. There, the orchard with its fruit safe from hungry insects’ jaws. The sleeping household dreams deeply of half term by the seaside and the dogs sleep with wild rabbits running through their minds. No one would see it coming. This is where I’ll break his heart. Dedicated to Miles Gallant, Charles Adrian, Gloria Sanders, Anton Chekhov, Philippe Gaulier, James and Paul, Paul Caister, Sylvia Plath, James Bottomley and past (criminal) loves.